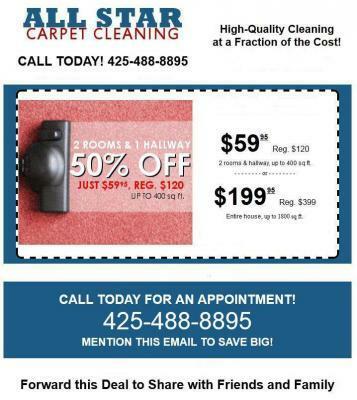 Carpet Cleaning in Redmond,Wa. happens all the time and at All Star Carpet Cleaning we clean carpets in Redmond all the time. We use state of the art truck mounted steam cleaning machines. When getting your carpets cleaned by a professional be reassured All Star Carpet Cleaning is very professional we guarantee everything we do. We use products that are safe for you and your family. Get that clean fresh feeling by having your carpets cleaned in Redmond,Wa. soon call today and make an appointment.
. Cleaning your carpets often will make your carpet last longer and of course look better. Vacuuming at least twice a week is also a good idea that will also improve the life of your carpet.